I have blogged days ago that I am staying away from junk foods. Anyway, the other day in Fair Price, I was craving for a potato chips. Since the cheapest brand doesn't taste good, I have decided to choose a different brand. By the way, there's Ruffles and Lays, which costs almost $3. 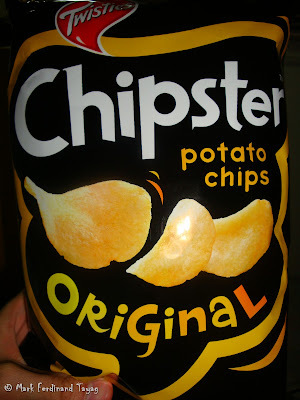 I saw this other Potato Chips brand "Chipsters" and was made from Malaysia. When I saw the tag price which is only less than $2, I immediately grabbed it. When it was about time to pay, I was shocked that it displayed a different price. If I will compare it to the price of Ruffles and Lays, there's only a 20 centavos difference. Damn! Anyway, when I tried it, it is actually delicious. I have to stay away with these chips though.